Hi! This is Henri Pirkkalainen from Excalion. I will answer to your questions. Thanks! Thanks for taking time answering some questions. Would you mind to introduce the band to rthe readers? Who had the idea for the bandname? Does it have a special meaning? We´re a Finnish metal band called Excalion and our debut album “Primal Exhale” has just been released worldwide. Excalion consists of five guys. Our former bass player Timo Sahlberg came up with the band name. It doesn´t have any special meaning. It just sounded pretty nice as we we´re thinking of possible name´s for the band. Timo actually split up with the band earlier this year because the lack of interest in playing bass. C.A Interactive made the cover artwork. The rest of the artwork is done by Louis Rodriquez, the guy from our record company “Sound Riot Records”. Which meaning does it have? We actually gave free hands to Chrille from C.A. This is what he came up with when he listened to our album. We loved it the moment we saw the outcome and I never even have asked what´s the meaning behind it. Heh. Maybe I should sometime. Let´s leave it to the listeners. They can decide for themselves. How would you discribe the album yourself? It´s a pretty good package. 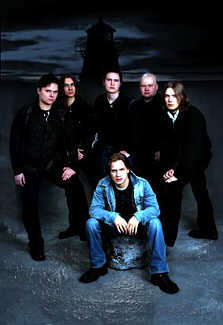 There´s alot of excellent vocal perfomances by Jarmo and great melodies, rhytms and riffs. There are some songs that have alot of influences from Power Metal but there are also some Hard Rock and progressive elements in there. I think we did quite a good job with “Primal Exhale”. The sounds and production was even better than I was expecting. Jarmo Myllyvirta, our keyboardist is our main songwriter. Normally he makes the basics for the song and brings it to the rehearsals where we decide as a group how to make it even better if necessary and of course add our own spice in it. Jarmo or Tero normally makes all the lyrics. Which topics do you handle in your lyrics? Is personal stuff involved? 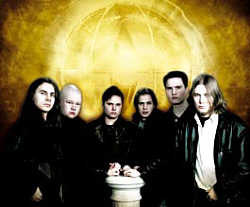 You sound very similar to other bands like Stratovarius for example. Do you want to achive this effect or do you want to create your own stile? No, we definately don´t want to sound like Stratovarius as much as we love the older stuff from them. The influ ences are of course present as you listen to our album but I´m sure people will find out that our music actually doesn´t have that much in common with them. I think we´re finding our own style and with the next album that we´ll make in the future we´ll sound even more like “Excalion”. How do you handle this comparisons? There will always be people who will comparison us with other Heavy bands. Actually all bands are compared to other bands and there´s no point in trying to change that. It´s a natural way for people to do and we are completally OK with that. We have been compared for example to: Edguy, Stratovarius, Sonata Arctica, Kamelot, Helloween and one song sounded in one´s opinion like “Dimmu Borgir with clear vocals”. Heh. Alot of different point of views. 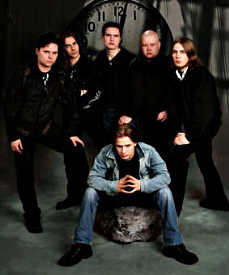 What do you think about the phenonemon that most finnish bands do (Symphotic) Power Metal or similar, many swedisch do (Melodic) Death Metal and so on? Is it because of the culture and so on in the different countrys, or just not getting out of clishees? I think culture is definately one of the main reasons why this happens but I can´t explain more. But it´s really interesting that someone knows the origin of a band just by listening to it. The pronounciation of the english lyrics is very good and clear, also for example Timo Kotipelto has a very good pronounciation. Are finnish people some natural talents at languages? Does the fact that your motherlanguage is so different make the thing easier or harder? English is a very natural language for us and the fact that they teach English even before you are ten years old, it just makes it feel pretty easy to understand and talk. What can one expect from you on stage? We´re are a very energetic band onstage. Our music works really well played live. Hopefully you´ll have a chance to come and see us somewhere! Will there be any touring in Germany? We´re still in search for a gig organizer so at this point it´s not possible but let´s hope that you don´t have to wait for long. No. That´s not our thing. What’s your attitude towards internetmagazine? It´s a really great way to reach people worldwide. It´s growing all the time and I guess in some point it´ll be the most common way of reading magazines. At least the music magazines. Finally some brainstorming: Ok, shoot! fans: The main reason music exists! The Lord of the Rings: Yes please. Just reading it. Jackson did great job with the movie trilogy. Love it. Thank you! The last words belong to you! Thanks for the interview. Had a great time doing it. “Primal Exhale” is out so go and check it out! We´re looking forward to see you all live somewhere.